The rover body is called the warm electronics box, or "WEB" for short. 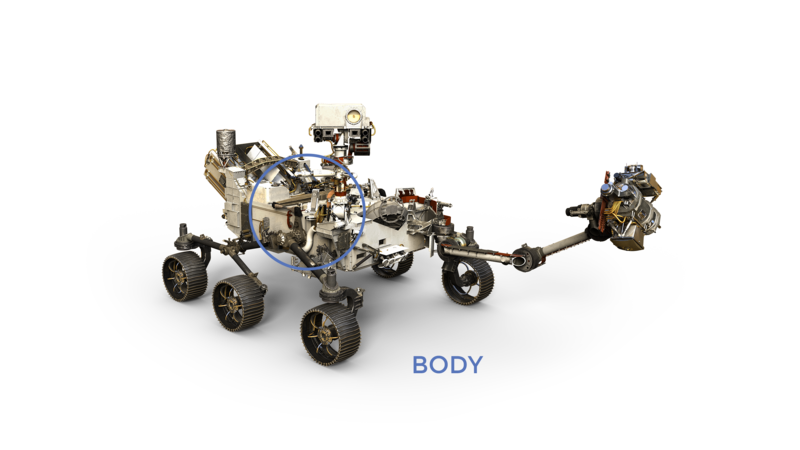 Like a car body, the rover body is a strong, outer layer that protects the rover's computer and electronics (which are basically the equivalent of the rover's brains and heart). The rover body thus keeps the rover's vital organs protected and temperature-controlled. The warm electronics box is closed on the top by a piece called the Rover Equipment Deck. The Rover Equipment Deck makes the rover like a convertible car, allowing a place for the rover mast and cameras to sit out in the Martian air, taking pictures with a clear view of the terrain as the rover travels. Structure: Bottom and sides are the frame of the chassis; top is the rover equipment deck (its "back"); bottom is the belly pan. Note that for new Sampling and Caching interior workspace, the belly pan in that front end of the rover (about first 1 1/2 feet from front end) is dropped soon after the rover lands. This exposes the workspace to Martian atmosphere and makes more room for sample handling operations within that workspace. The Mars 2020 rover relies on the successful design of the Mars Science Laboratory rover, Curiosity. However, the Mars 2020 rover has a new science and technology toolbox. An important difference is that this rover can sample and cache minerals. To do so, the rover has a new coring drill to collect samples. The samples are then sealed in tubes and placed on the surface of Mars. In the future, another space mission could potentially pick up the samples and bring them to Earth for detailed analysis. Mars 2020 will collect rock cores. Mars 2020 needs to collect rock core samples and save them for possible future study by scientists. Curiosity studied samples collected onsite, using the rover's onboard laboratory. Mars 2020 has a larger "hand," or turret. Mars 2020's new functions and new science tools means it must accommodate a larger turret at the end of the robot arm. This turret has the coring drill and two science instruments, plus a color camera for close-up surface inspection and also "selfies" for engineering health checkups. There is an internal workspace inside the rover body that is dedicated to picking up, moving and placing drill bits and sample tubes within the Sample Caching System. New motors that drive these specialized movements were needed beyond those used on rover Curiosity. The rover motor controller electronics have been modified from the Curiosity design to accommodate these motors. Mars 2020 will operate very differently than Curiosity. The new rover will gather 20 sealed samples of Martian rocks and soil. The samples will be set aside in a "cache" on Mars. The team is building new software to run the rover. The software will be updated with improvements throughout the mission. Besides just managing the new sampling operations, the Mars 2020 rover manages all of its daily activities more efficiently to balance its on-site science measurements while also collecting samples for potential future analysis. To do that, the rover's driving software - the "brains" for moving around -- was changed to give Mars 2020 greater independence than Curiosity ever had. This allows Mars 2020 to cover more ground without consulting controllers on Earth so frequently. Also, engineers have added a "simple planner" to the flight software. This allows more effective and autonomous use of electrical power and other rover resources. It allows the rover to shift the time of some activities to take advantage of openings in the daily operations schedule. Engineers redesigned the Mars 2020 wheels to be more robust due to the wear and tear the Curiosity rover wheels endured while driving over sharp, pointy rocks. Mars 2020's wheels are narrower than Curiosity's, but bigger in diameter and made of thicker aluminum. The combination of the larger instrument suite, new Sampling and Caching System, and modified wheels makes Mars 2020 heavier than its predecessor, Curiosity.